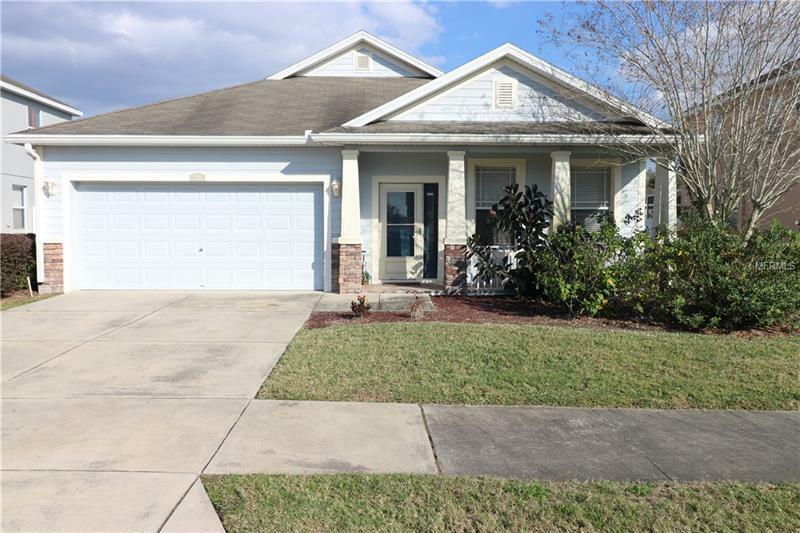 Welcome Home to a Move In Ready Magnolia Green home with front porch overlooking the playground/park area and just minutes to walk to the community pool. Extra bonuses in this home you dont find in a new builder home such as the oversized screened paver deck patio with white PVC fenced private yard to enjoy the outdoor space and let the kids and dogs play safely. The AC System was replaced & upgraded in 2014 (warranty to 2024) to include AC Unit, Thermostat, Air Handler, Heat Pump, Fresh Air UV System to sterilize airflow and efficient duct work. Protect the ground around your home with one of the few homes a complete gutter system to divert rain water away from the home and entry doors. This layout has high ceilings and open spaces with lots of natural light for entertaining family and friends and a large open kitchen with island and tall 42" cabinets. Ceiling fans in all bedrooms & Tile throughout the home with carpet only in the bedrooms. The Master bedroom is the perfect space with enough room for a king size bed and furniture with a walk in closet and adjoining master bath that also meets expectations with step in shower and dual vanity. Added bonus is a large laundry room to complete the package. Come check out the family friendly community and stop fighting traffic. Plant City is a great place to raise a family and has lots of activities year round and the fresh strawberries all around. This home is priced well - dont let this one get by!